Two new HUGE Sea Also Rises Prints- Now Available! THE SEA ALSO RISES- TURTLES AND SHARKS! 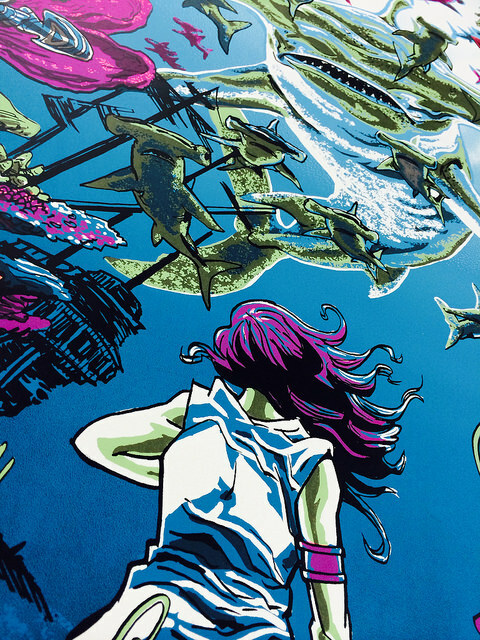 For the first time on Nakatomi , we have 2 BIG 24×36 prints in artist Tim Doyle’s ongoing ‘The Sea Also Rises’ series of prints, available HERE NOW. 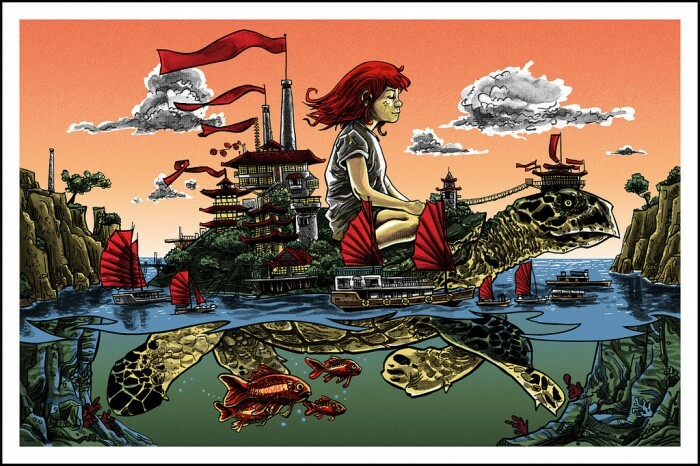 Pictured above is ‘The Sea Also Rises: The Exodus of Turtleton’ which is signed and numbered in an edition of 200 worldwide. And this print, the newest in the series is called ‘The Sea Also Rises: The Fleet Deploys’, which also measures 24×36 and is signed and numbered in a first edition of 150. 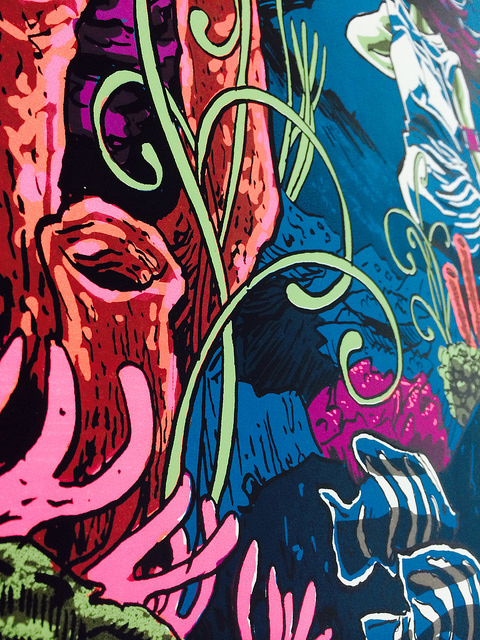 Features eye-popping florescent ink throughout the print! “The Sea Also Rises series is by far the favorite thing I get to work on. It’s been rolling off and on for 5 years now, almost as long as I’ve had Nakatomi. The whole series comes from a place of deep concern for how humans interact with their environment, and the long-range consequences of our actions today. And for whatever reason, the way my brain works means that concern comes out as Sea Monsters will rising up to take us out, to prevent further damage. 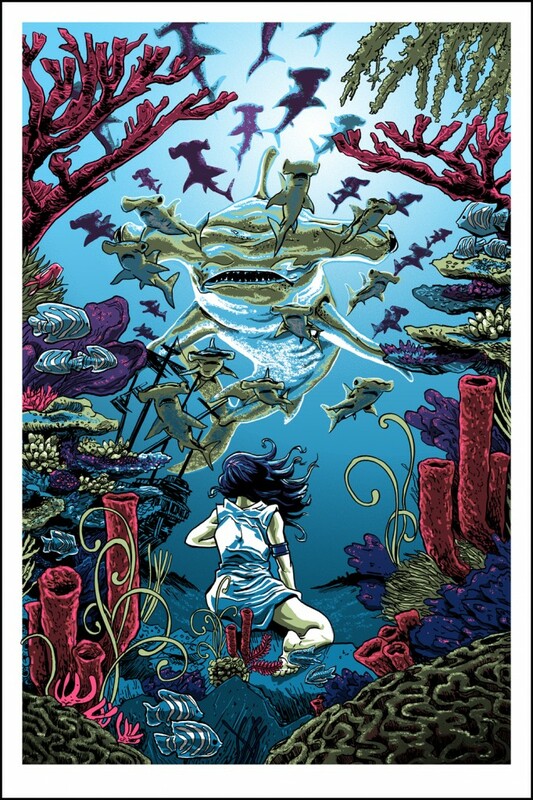 These two prints were originally commissioned by PangeaSeed for their ‘Sea of Change’ series, which helps to raise awareness about several issues pertaining to the oceans, most notably the practice of shark finning. 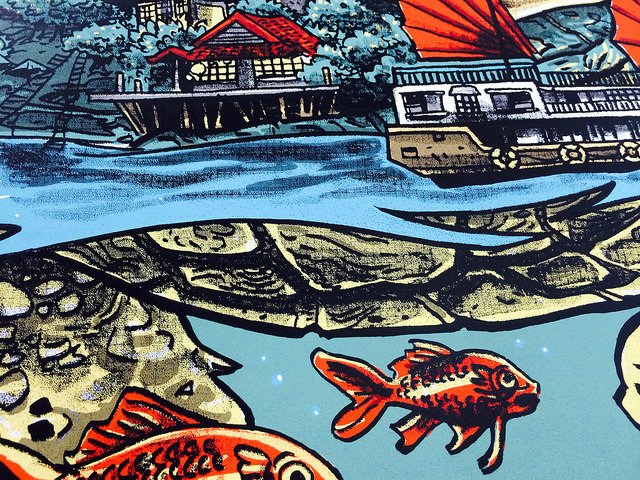 Exodus of Turtleton depicts a city- turtle, leaving it’s post off the coast of Japan, carrying an Earth-Spirit serenely away to safety. It’s definitely one of the more up-lifting images in the series, as nothing is blowing up or being attacked! I thought a lot about my children while creating this one, and how I could use a large turtle to carry them to safety one day. Or just carry them for a few hours, so I can catch a nap. 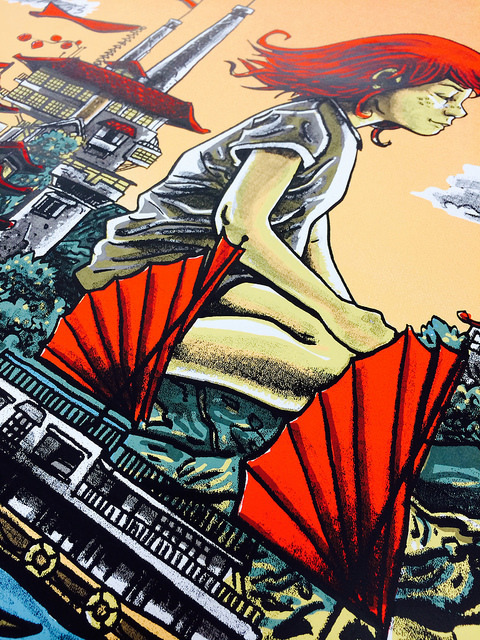 These big, beautiful, vibrant prints are in hand and ready for immediate shipment! Pick them up HERE NOW.